The ingredient Fly Amanita Cap comes from the plant "Fly Amanita". There are actually 4 varieties of this plant, all of which yield the same ingredient. 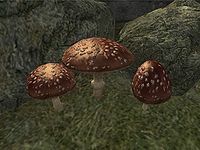 Fly Amanita is a mushroom that is very common in cities, especially the Imperial City, and in the Great Forest region. This page was last modified on 29 April 2014, at 19:55.